Orange and Red BlackBerry Curves coming to Sprint | BlackBerry Blast! Internal Sprint launch documents have been posted by BerryReview. The docs show new BlackBerry colors in the works for Sprint. 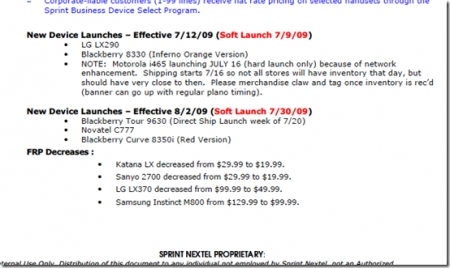 A BlackBerry Curve 8330 in Inferno Orange and a Red 8350i will be heading to Sprint at the end of the month. Right now all eyes are on the BlackBerry Tour but these new colors could give Sprint some pop.